THE PURPOSE OF TIRE REGISTRATION IS TO ENABLE US TO CONTACT YOU DIRECTLY IN THE EVENT OF A RECALL. WHILE A RECALL IS UNLIKELY, IT’S IMPORTANT TO MAKE SURE YOUR TIRES ARE PROPERLY REGISTERED. DOT (stands for Department of Transportation) means that the tire complies with all applicable transportation safety standards established in the United States. 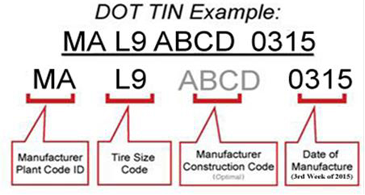 The DOT or serial number must begin with the letters “DOT” followed by a combination of numbers and letters up to 12 characters. You can find the DOT number on the sidewall of your tires as shown in the example below.